Some of the Most Beautiful Beaches Indonesia - Indonesia is rich in beautiful places distant skyline. As below Latest News will present a refreshing view of the eye, it could be after seeing places Indonesia's Most Beautiful Sea you immediately want to go there with family, friends, friends or boyfriend. Nusa Penida Island is located one hour from Bali, Nusa Penida Island has one of the healthiest coral reefs can be seen clearly from a distance of 15 to 35 meters. Banya are diving on the north coast. Among them Blue Corner, Nusa Lembongan and Gamat. Please you dive there to enjoy the beauty of the underwater world at the same time challenge. Bintan, Riau, has 18 miles of white sand beaches with rich marine life. You can see the deep sea canyon directly based on average 8 meters, not far from the beach. It's the perfect place for you to learn to dive. Not only that you can also explore an old tanker yng has long been sunk. Thousand Islands, Jakarta, is the place where the buildings and jalananny jammed. But who would have thought, in Jakarta, it can also enjoy the beauty of the sea. Thousand Islands, the pretty house reef. To get there just to travel one to two hours from the dock Marina, Jakarta using speedboats. 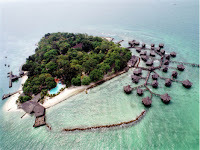 Some famous yng island Pulau Kotok Large, Small Kotok Island, Coral Hunchback, Sepa Island and Island Pantara. You simply rent a boat yng smaller sliding dive, certainly not less beautiful with the rest of Indonesia. There Karimun islands, Java Sea still has a paradise of coral reefs, in addition to the Thousand Islands. In the north of Semarang, Central Java. There Karimun islands of Java, consists of 27 islands covered rows of blue coral Acropora coral reefs. In Karimun Jawa You can also see the carcass Indonour, a merchant ship that sank in 1955. You can also swim with baby sharks in captivity Location:? . In the capital of Berau district, about 50 miles Cape Redeb, there is a spectacular reef with underwater caves. Derawan island its name, the island has more than 17 dive sites, with its own uniqueness. Some famous locations around the island Sangalaki, Kakaban and Maratua Island. In Sangalaki yourself, you can see different kinds of stingrays, squid and tiger sharks. You can observe giant tortoises lay eggs at night. And Kakaban stranded in salt water lake contains no stingless jellyfish. In Maratua Island, barracuda and tuna can be found everywhere. Could even see hammerhead sharks and eight species of dolphins. Komodo Island. Not just dragons yng scattered on Komodo Island. But under the sea, there are different kinds of colorful fish yng very beautiful. The dive sites on the island of Komodo, among others Sebayour Small, Small and Middle Island Red Beach, this place is one of the Most Beautiful Sea in Indonesia. You also can go to the west island of Flores as Tatawa, Small Tatawa Island, Rinca and Nusa Node. Bunaken, North Sulawesi, has an international reputation for beauty menyelamny 16 locations, including 30 meter slope that is home to many species of fish and marine life. Some of the major dive sites are Sialdoen Island, Ganges, Mantehage, Nine and sea volcano named Manado Tua. Lembeh Strait, North Sulawesi, the location is famous for its unique marine life yng, such as octopus chameleon, mini seahorse, fish, frogs and flamboyant cuttlefish. But Lembeh Strait is only suitable for experienced divers. So be careful for beginners should wait before a new professional challenge in trying to Lembeh Strait.